First, a note on safety. 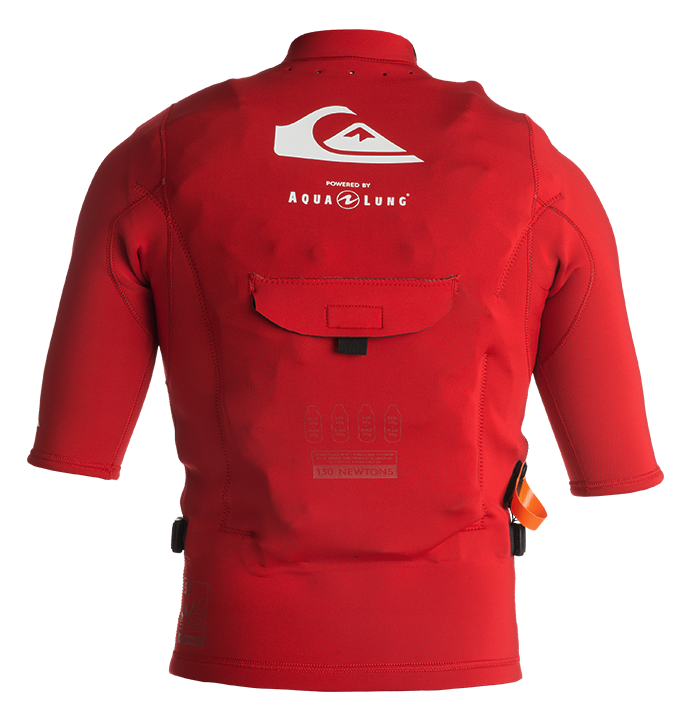 The Quiksilver Highline Airlift vest is designed for use by experienced adult surfers. Using it successfully requires strong swimming skills, ocean knowledge, collaboration with other surfers and lifeguards, and like the rest of your equipment — it must be cared for and used correctly. Proper use of the vest requires adherence to manufacturer’s instructions. The Airlift vest is a safety tool, not a performance enhancer. Do not take greater risks while using this vest. A new generation of big wave riding demands a new generation of water safety. That’s where the Airlift vest comes in. A culmination of years worth of research and development, the neoprene vest utilizes carbon-dioxide cartridges to help bring the wearer to the surface in heavy hold-down situations. It’s an innovative product designed for innovative surfing at the world’s heaviest waves. When we started developing the Airlift vest, we knew it would be best to partner up with a company that would match our devotion to the project. Aqua Lung is a global leader in scuba diving equipment — they were an easy choice for the partnership. Late nights. Early mornings. Countless hours and numerous tests. That’s what the Quiksilver Highline Airlift vest is made of — because you can’t afford to take chances on a product like this. Quiksilver’s big wave riders and Innovation Team spent two years collaborating with Aqua Lung engineers to make this idea come to life. Every last detail was considered, refined and innovated. Our test team is the heart of this project. We’re extremely privileged to have had a group of individuals with peerless knowledge, talent and experience to draw from during the past two years of intensive testing. We remind you that preparation doesn’t just mean stretching on the beach before you paddle out. It’s more than just checking the charts or getting all your gear in order during the days leading up to a swell. True preparation also means dedicating years of your life to surfing waves of consequence. 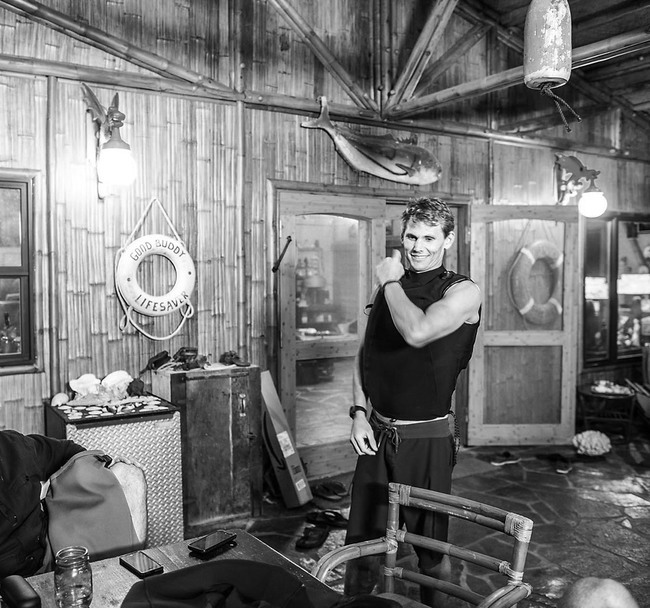 But, once you’re ready for it, the AirLift vest is designed to create an extra layer of safety for committed big wave surfers. The Airlift vest is made with Quiksilver’s best neoprene and can be worn over the top of a wetsuit, or as a standalone vest. That means you stay safer at any wave, anywhere, regardless of the water temp. The Airlift vest features four separate inflation tabs in considered locations on the chest for the ease of inflation in the hardest of times. A deflation tab is located away from the inflation tabs to reduce the risk of an accidental inflation or deflation. Every function. Every feature. Browse our instructions manual or scroll over the vest to see all the technology we put into the Airlift. Oral inflate valve is available for partial inflation and conserving CO2 cartridges for emergency use. 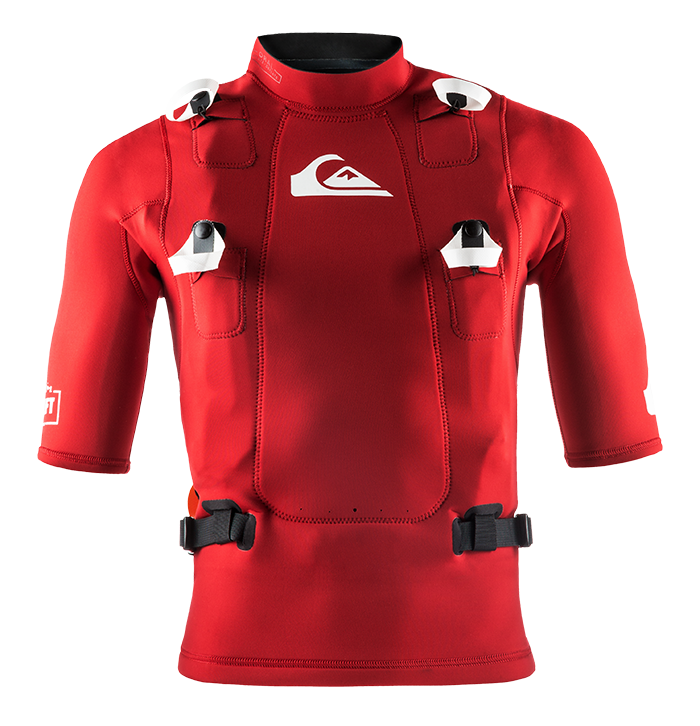 Built-in lower midsection torso strap secures the inflation vest to the surfer. To emergency deflate the vest. Improve safety when it is safer to go deep under the wave. The vest holds 4 CO2. 1 Cartridge is enough to fill the bladder. For safety reasons, we strongly recommend that you never use your AirLift vest with only one cartridge left. The Dump Valve automatically releases the excess CO2 from the bladder. Swap in fresh CO2 cartridges without removing the vest. Looking for an authorized Quiksilver Highline Airlift vest dealer? Here is the official list where to buy the vest. Are you a journalist or blogger? Click here to download full press kit including press release, packshots, lifestyle shots and videos.